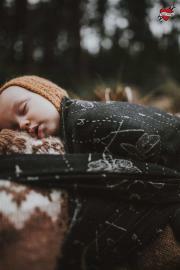 This is our new pattern design inspired by forest and night. The colors resemble undergrowth. Moths, ferns and stars symbolize the fauna and flora of the forest, which can be seen in the moonlight. 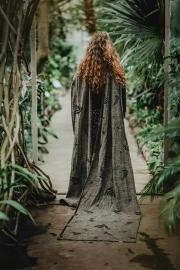 This wrap is made from 74% fluffy cotton and 26% tussah silk. You can feel like on a forest moss. Incredible, mystical lunar eclipse in which the Sun, Moon and Earth align. At one time equated to Apocalypse, but in fact one of the most beautiful phenomena we could see recently in the sky. Beautiful combination of navy blue firmament with expressive red became an inspiration to create an exceptional wrap: “Bloody Moon”. It was obvious that I reached for the most symbolic and mysterious design, such as “Les tenebres”. I must admit that the effect is spectacular. 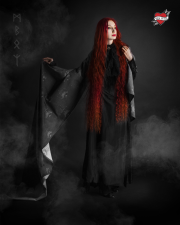 Bloody Moon is a remarkable quality organic combed cotton. 270 gsm of navy blue, deep as an evening sky on a cloudless night, lightened with magical red. As always I tried to create something amazing and I am sure you will be thrilled; this wrap is unusually elegant, fantastic quality and vegan. 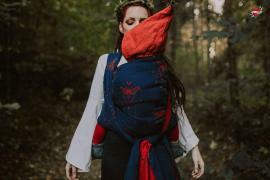 „Bloody Moon” is a magical wrap, that will cuddle a newbie to sleep and also carry a few-year-old. No matter what is your child’s weight, you will uncontrollably fall in love with it.